Placing a servo in the model. The servo reach the requested absolute angular position by making all required 2PI rotations. For example, if the current servo angle is 0 rad and the requested position is 6PI+0.0001 rad : the servo will make 3 complete 2PI rotations + 0.0001 rad. If the current position is -180.0° and the requested position is +180.0°, the servo will first go in 0° direction then in +180.0° direction. If the current position is -180.0° and the requested position is +180.0°, the servo will not rotate. Show the Modify panel then select the Devices sub-panel. Click on Choose Device icon to open the list of plugins that may be attached to this geometry. Mount As: represents the name of the device in the simulation. Startup: Set it to 'On' to force servo to maintain position 0 (see below). Value of the lowest index for calculating position. Value of the highest index for calculating position. Enable/disable continuous rotations (as a simple motor speed command). Indicates if servo is able to remember all rotations and maintain an absolute global angle. 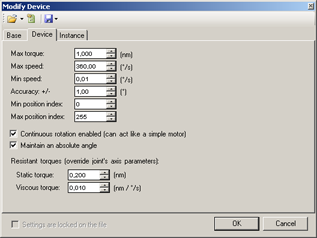 In MODA programming, motors are accessible via the (or DeviceServoMotor class) class. The servo's full path, starting at PHX "/" is hinge0/a1/servo. Documentation v4.7 (18/01/2015), Copyright (c) 2015 anyKode. All rights reserved.